So how many days has it been since I've mentioned my love of graham? It's just one of those things that I love, specifically when it's a graham cracker crust. Oh, I'm a sucker for a graham cracker crust.... Great, now I want a slice of chocolate cream pie. Anyway, must focus. 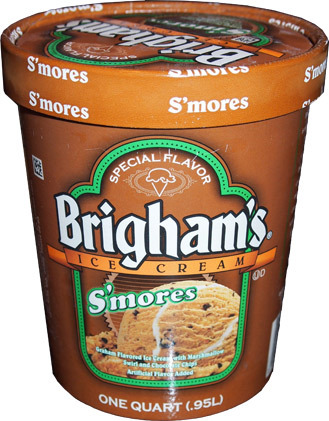 This is special flavor Brigham's S'mores Ice Cream and I nearly wept (tears of joy) when I read the description: Graham Flavored Ice Cream with Marshmallow Swirl and Chocolate Chips. That's right, graham flavored ice cream. I love a good graham swirl, but I am psyched about graham ice cream. National brand S'mores isn't new, but an actually graham flavored based is something that I've only seen attempted locally once before. Now, we don't cover Brigham's too much because even though they were my first introduction to premium ice cream during freshman year of college, I kind of forgot about them after meeting many, many pints of Ben & Jerry's. Brigham's makes fine ice cream, and it used to come in these cute little single serve size containers in the school store, but they're just not nearly as fun as B&J. Distribution is limited to the northeast, so I know many of you won't be able to grab this one, but it's time to get Brigham's back on the blog. I crack open the quart, take a huge whiff and am stunned by the wonderful aroma of graham. Mmmmmm, I don't even need to eat this one, I'm just going to sniff it all day... ok, that sounds weird, but this ice cream really does smell like I've just opened a fresh box of keebler graham cracker crumbs. I hope it tastes half as good as it smells. Oh wait, don't forget to notice the bright white, squishy marshmallow swirls along with a plethora of small chocolate chip bits ranging from itty bitty to small (they've used actual tiny chocolate chips, some of which are still intact). This is definitely a good looking ice cream.... not that I would be opposed to a graham or fudge swirl, too. I dig in and I am impressed from the very first bite. This one really does taste like graham. Finally, after all this time, it's a little company in my own back yard that finally manages to tack down graham flavored ice cream. To me, graham is synonymous with desserts, so I don't know why more companies don't try this. I mean, we've got several attempts at a s'mores flavor, but this is the first time that my tastes buds have ever been encircled by such a complete graham flavor. My only problem on this first scoop is that my brain wants some graham grit to go with all this flavor. Sure, there are a ton of chip bits everywhere, but other than the occasional tiny thud, this is a regular creamy ice cream. I know, I know, I'm nit picking, but it's what ran through my head. I'm also not hitting a ton of marshmallow swirl or flavor for that matter. Oh sure I see it, but it's not really coming across at all. Neither is the chocolate flavor for that matter. Graham is pretty much hogging all the spot light. If you love graham like I do, you need to try this. No, it doesn't nail the S'mores flavor, but I'm thinking a little high quality chocolate sauce could fix that. My wife says the graham flavor is too strong for her liking, so I am thinking of maybe serving a scoop of this with a scoop of Rocky Road. Mmmmmmmmmmm, man that would be excellent... oh I wish I had some rocky road handy right now. On Second Scoop: I couldn't wait to try this one again since it hit the spot so well the first time. I scoop myself a nice size bowl, plop in front of the tv (bring back Jamar! ), and enjoy my treat. Mmmm, still lovin' the graham flavor. It's nice and strong and puts a smile on my face. I take some more bites... and some more... and some more... and that's when I start noticing something. There's a little bit of flavor funk building up. The packaging mentions artificial flavor and I think it's gently building up in the background. It's not terrible by any means, but there's definitely something there..... actually, upon further investigation, I'm not sure its the graham flavor or the marshmallow flavor that is acting up (or maybe both). It's going to be an issue for some, but I have to admit, I'm still excited to come home to this one. 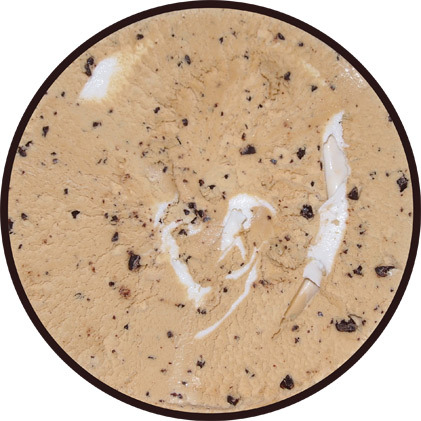 I think you'd enjoy this turkey hill flavor http://turkeyhill.com/products/premium-ice-cream-flavors.aspx?pID=151 I remember trying it when I was visiting family awhile ago and I fell in love. If only they'd just re-brand it for the yankees or something so I could get it in NY. I love graham, specifically the Graham Slam flavor and thought of it immediately when I saw this review. You must try it, it's awesome and one of my faves! The Turkey Hill Graham Slam Ice Cream is addicting. Not only is the ice cream flavored like graham crackers but there is such an amazing graham swirl everywhere. We are moving to Florida soon, no Turkey Hill there. There is a bit of mourning the lose in our house. Love the graham! And you should trademark the phrase "graham grit" because it's very cute! Turkey hill is always growing! Maybe they will make it down there! Looks delicious; like the look of the big marshmallow swirl as well, if only they had some crunchy graham bits in there as well. The BEST ice cream I have ever had, (besides Jenni's salty caramel in Columbus, OH) is Graham Central Station, made by Bruster's, at one of their Atlanta locations. It is addictive and they only have it sometimes, but it is SO good. It has the gritty graham swirls with chunks of chocolate. It is amazing, you should try to track some down if possible.